Cognitive and Behavioral Practice is a quarterly international journal with the primary mission of clinical dissemination: to bridge the gap between published clinical research and the actual clinical practice of cognitive and behavioral therapies. 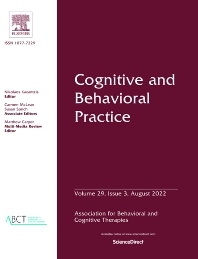 Cognitive and Behavioral Practice publishes clinically rich accounts of innovative assessment and therapeutic procedures that are clearly grounded in evidence-based practice. The primary focus is on application and implementation of procedures. Accordingly, topics are selected to address current challenges facing practitioners, both in terms of technique, process, and the content of treatment. To meet this goal, articles may include rich descriptions of clinical interventions, examples of client-therapist dialog, embedded video clips readers can view on line, and/or significant case descriptions. In addition to regular articles, the journal includes special series, case conferences, clinical commentaries, clinical reviews, and book reviews. Special series contain multiple manuscripts that center on a particular diagnostic category, population or therapeutic strategy. Case series contain a case description with authors responding to various aspects of the treatment approach. Clinical commentaries are brief articles (solicited and unsolicited) in which experts in the field comment on the most up-to-date clinical topics, controversies, or discoveries within their expertise. Clinical reviews are regular length review articles that focus specifically on clinical strategy and existing evidence base for that strategy. This journal is for the practicing mental health clinician, instructors, and researchers with an interest in the clinical dissemination of their findings. Continuing education examinations are included in each issue.